Summary: This is a walk in one of my favourite local walking areas in the triangle of countryside between Leeds, Harrogate and Wetherby but this one is not written by me. It is written by my good friend Martyn Lee. He revisits favourite places from his childhood and youth including Spofforth Castle. Martyn also travels the countryside between Spofforth, Kirkby Overblow and Sicklinghall while recalling anecdotes. It is a lovely walk so I invite you to enjoy Martyn's story which should encourage you to enjoy this walk too. Wednesday 20th October, 2010. The day had ''Walk'' written all over it, not a cloud in the sky, piercing sunshine and a crisp, firm going underfoot. A perfect autumn walk. I chose a route close to home in preference to the usual escapade to the Dales. A charming triangular route encompassing three charming villages in the Harrogate area. The walk also has the added charm of passing several pubs en route, a bonus for the thirsty and unhurried. The starting point would be an old childhood haunt of mine, Spofforth Castle. An eerie locale, even in broad daylight! Home of the Percy family in the middle ages, it was shelled by Parliamentarian troops in the Civil war and has lay in ruins ever since. 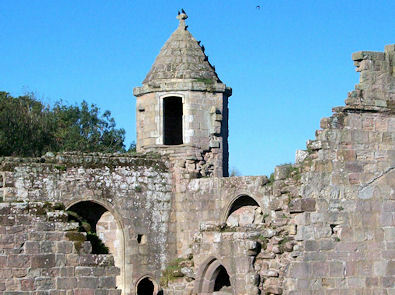 Notwithstanding, the turret at the Northwestern corner still stands proud and is reputedly home to the ghost of a lady who jumped from the top of the tower. 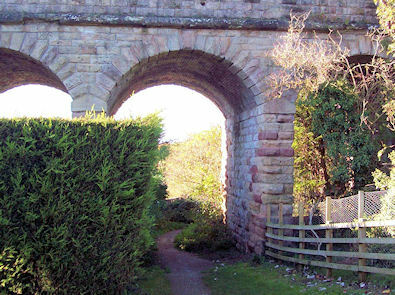 From the castle, leave the grounds along Manor Garth and follow the path underneath an old stone rail bridge. 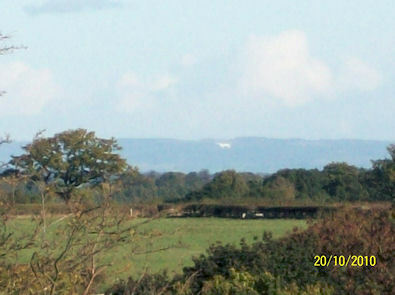 Kilburn White Horse seen from Spofforth! Progressing up a slight hill after the railway bridge the path bisects Spofforth Golf Course for several hundred metres before reaching open pastures. Continue over a small footbridge with Lodge Wood on the right hand side. 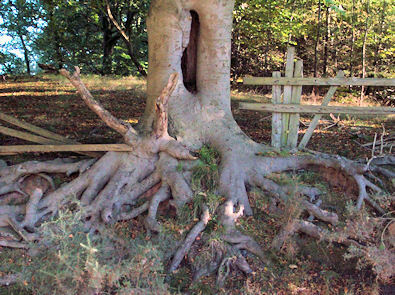 At the end of the wood there are several curiosities, including a hidden pond and huge spider-like tree stump. Sadly, the cup-and-ring marked boulder on the map eluded me on this day. Pressing on due west on a track through farmland, this clear day afforded me excellent panoramas of the surrounding countryside, even the Kilburn white horse which was clear to see! I followed the track in a Westerly direction to Sunrise farm before turning more Southerly to the village of Kirkby Overblow. The village was featured in the Domesday book, and is so-named due to its Iron-smelting past. 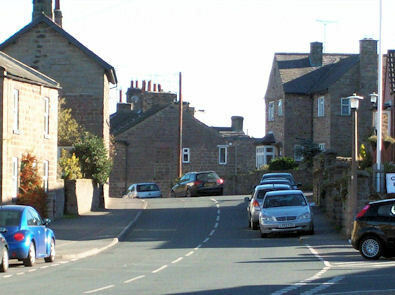 Following the main road SE through the village, the cross-country path resumes to the left amongst the last of the houses. The route now heads in an Easterly direction, alongside hedgerows and skirting a small wood. At the end of the wood, turn hard right over the wall onto the 'Keeper's walk', keeping the fence on your immediate right. Across several fields, meeting several sedentary bullocks, the route again changes direction. 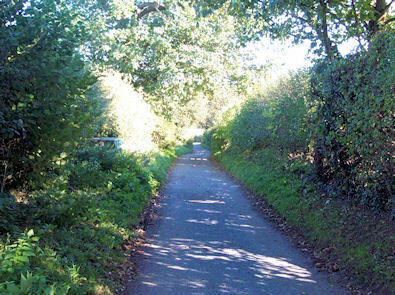 This time, a wall and hedgerow have to be crossed onto Marsh Lane, a small track. The way across onto the track is far from obvious, and caused me momentary disorientation I must admit! This can be corrected by negotiating a gap in the wall a few hundred metres further down so all is not lost. 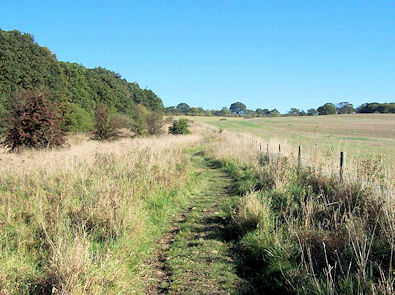 Further farmland and open meadows surround the track from here, before a slight incline with Addlethorpe Wood on the left hand side. From here, turn right down Addlethorpe Lane to meet the main road into Sicklinghall village, which is reached after a brief half-mile walk on the roadside verge. There are several paths from this village across open countryside. 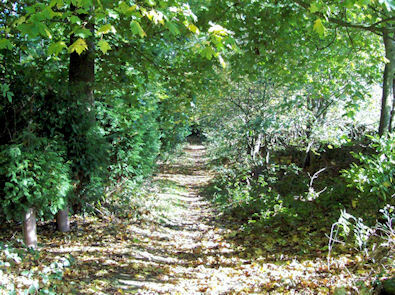 This path lies at the far end of the village, passing the Scotts Arms and village pond (another boyhood resort of mine). Simply take a left onto Stockeld Lane immediately after the pond. Follow Stockeld lane for around 100 metres. Keep a close look out for the style onto the fields on the left, which can become very overgrown in Summer! From here, walking due North, there are several open fields to cross and styles to negotiate, with the grounds of Stockeld Park with its Christmas tree plantations visible on the far right hand side. Continue due North and meet Park lane on the outskirts of Spofforth, crossing the road onto the path on the far side. With the cricket ground over to the left, the end is near when again a stone rail bridge comes into view. Once under the bridge, continue straight ahead to the wooden gate which is marked as a right of way. Anyone who ventures into the farmyard over to the right may encounter a very verbal Collie, employed full-time to stand guard. I have met his acquaintance once, which was enough! At the end of the path turn left to process through the village to the starting point at Spofforth Castle. Three villages, and hopefully, a great day out!